I just want to say thank you. Engine is installed and works like a dream. VERY VERY good service. I will be a repeat customer. Had purchased my dodge charger rt, from a car dealer on long island. The first week it over heated. Dealer said it was fine, but my mechanic said block was cracked. They refused to repair. I looked on the internet for a good, used engine. Took me awhile but finally came across First Class Engines. They were very knowledgeable and courteous. I had my engine within a week, and was up and running better than the first engine. Needless to say, after a year and a half, one of the cam arms broke. I spoke with Matt, had all my necesarry paper work in order that was REQUIRED in the warranty. They are replacing the engine like they said!!!! I will never go anywhere else for my engine needs. Thank you first classengines!! 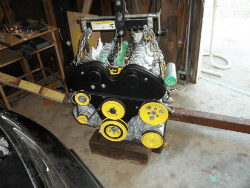 I recently bought an used engine for my Cadillac CTS from your company, I always was concerned about buying anything from internet sites, especially a 1700$ used engine, but I had no other options so I did it. I must say your company exceeded my expectations, I got my engine in a very good shape in just three days and it’s working fine too. When I was ordering I asked about the vin# and the Fedex tracking # , you sent them to me without any hesitation. The motor in my daughter’s 2006 Honda Pilot died, but the chassis , body, and interior were still good. My mechanic suggested that I look at a replacement engine. I had never done this before, but knew that it was important that we get the “right replacement “. I looked online, and the BBB ratings for several suppliers. After further deliberation I took the VIN number from her car and began the search. First Class Engines was helpful to take my vehicle information, and respond back quickly with a low mileage replacement. I had it shipped directly to my mechanic, and in day and a half they had the car running again. The mechanic was impressed with the quality of the replacement, and my daughter is pleased to have her back in service. Thank you first class engines. Just wanted to do a follow up on our experience purchasing an engine from First Class Engines for our 2012 Kia Forte Ex. We appreciate your professionalism in assisting us in the process and getting the engine shipped in good order to our installer. When our installer found that even though the paperwork showed we had received a 2.0 Federal, he saw that it was actually a 2.0 California. After contacting you and even though your paperwork showed it to be a Federal, you immediately shipped with priority another engine verified to be a Federal. This was done even though your policy is to not ship another engine until the original incorrect was first returned. After installation, engine fired up on first turn of the key and everything checked out ok ! Would definitely recommend to anyone having to replace an engine, think you would have to look no further than First Class Engines. We picked up our 2014 Chrysler Town and Country yesterday and the engine was running smooth. Thanks for your good service. Engine was delivered when and how you said it would. The engine was clean, runs strong and no leaks. My brother has been a mechanic for over 50 years and was impressed with your warranty. He said you knew what you were doing when you asked that certain items be replaced. 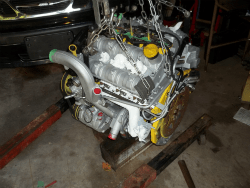 My name is Brent D & I bought an engine for a 2011 Chevy traverse and it was the right engine and things went smooth from the purchase to the install. My wife and I are very pleased with the time it took to recieve the engine. Thanks for not dropping the ball and making things happen for us. We will write an "A" review on google. I purchased a 2006 Hyundai Elantra 2.0 L engine (38,000 miles) from First Class Engines of Twin Lakes, WI in September of 2016. This was by far my largest internet purchase and involved a need for mechanical knowledge well beyond my experience. Jay was knowledgeable and professional throughout the transaction from ensuring an appropriate match in selecting an engine to issuing an honest invoice and shipping the engine promptly despite the Labor Day weekend. Jay explained the testing process employed by First Class Engines to ensure good quality used replacement engines. At my request, Jay spoke with my local mechanic to confirm that the engine would meet our needs and to answer my mechanic's questions and concerns. This excellent customer service, as well as Jay's candid answers to questions, provided me with the confidence to place my order. My mechanic confirmed that the engine was received in the condition as represented by First Class Engines and had no difficulty with fit or compatibility during installation. The engine has been functioning trouble-free for nine months to date giving further evidence that the inspection conducted by First Class Engines prior to sale is sufficiently comprehensive. Given my positive experience with all aspects of the transaction, I would not hesitate to purchase again from First Class Engines. I was quoted on a 2010 2.4L Pontiac Vibe engine at a very fair price for an engine with only 61K. I ordered it on Thursday and it was received on the following Tuesday packed well and great shape. Keep in mind it shipped from Wisconsin to Oklahoma. This happened because Firstclassengines did what they said they would do. Engine is installed and runs great. Arrived very clean and the condition I was told it would be. It's been a few months now and the engine w/in my Edge runs Excellent (knock on wood). I just want to say thanks for providing excellent customer care and overall professionalism. Thank you again as I can see myself doing business w/ your company in the future. I will continue to spread the word and thanks once again! Matt, I am so happy with engine that I bought from you. When I called you I had no idea what to expect. I tried to buy one from another place but they sold it out from under me and didn't bother to say anything. I found your website, gave you a call and within a week I'm driving my car again. The courtesy and professionalism you showed me went beyond what is typical. You answered every question and even did your best to find me an engine after hours. This was the best experience I've had with having to find an engine and be confident that it will work. Thanks to you and your team. I will definitely call you again if I ever need a motor or transmission. Best of luck and thanks again. He returned it to the Mitsubishi dealer this past week for a general re-check & to ensure all fluids were holding level---all systems 100%! Cannot thank you enough for your diligence in locating this engine (extremely rare—who knew?!) for us. Your consummate professionalism & politeness are much appreciated----made us feel as if you were always working for us. Very refreshing, especially in today’s business atmosphere, where one may feel as if a company doesn’t really care. You proved First Class Engines truly cares for their customers. Every day. To say it was a pleasure doing business with you is not only cliché, it’s the understatement of the year! By the way, the shipment to the dealer was ultra-fast; & when they saw the engine I’m told the technicians exclaimed ‘it looks brand new!’. I just wanted to write you a little note and tell you THANKS!. Jim finished up putting the engine in the daughter's Suzuki on Monday, April 06th(2015), turned the key on and it took right off and purrs like a kitten. Anyone ever asks us where to get an engine we are going to tell them about First Class Engines. Hi. I recently purchased an engine from First Class and I want to say they live up to their name. Not only did the engine arrive on time but my mechanic commented on how clean it was. It has been installed and is running great. Big thanks to First Class engines for taking care of me. I'm really appreciated and thankful for doing business with them. The engine is good and running perfect since it's been installed. I'm satisfied and recommend other people who need the right engine to be replaced for their vehicle engine - even if I need another engine, First Class Engines is the way to go!! Thank you First Class for helping me get back out on the road again. My 2002 Mitsubishi Eclipse GS 2.4L motor arrived prompt and was VERY clean. The mechanic installed it and on the first turn of the key she fired right up and it runs flawlessly! 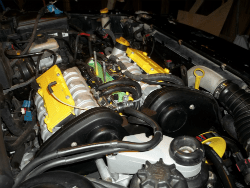 I am a very satisfied customer and I would recommend First Class Engines for your next used motor replacement project." 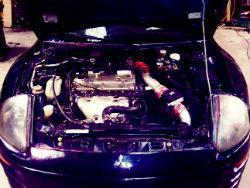 JJ sent us this picture of his beautiful used engine after he installed it.